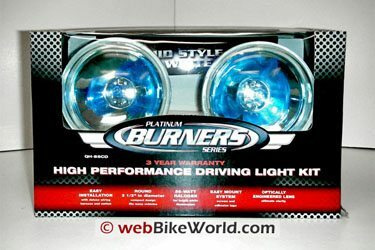 The Platinum Burner QH-75IT driving lights have a strong, concentrated light pattern and provide a good deal of additional light at a very reasonable price. 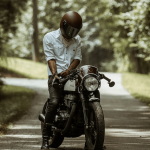 This article details the results of an evaluation of an inexpensive motorcycle driving light kit to determine its applicability for use on a motorcycle as an auxiliary light source. 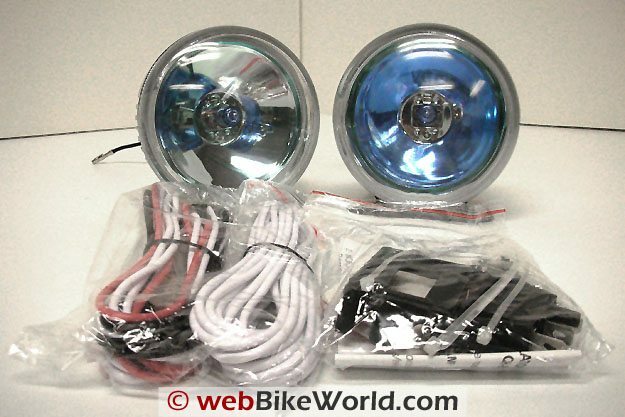 The “Platinum Burner” QH-75IT High Performance Driving Light Kit is one of eight different lighting kits evaluated for use as motorcycle driving lights. 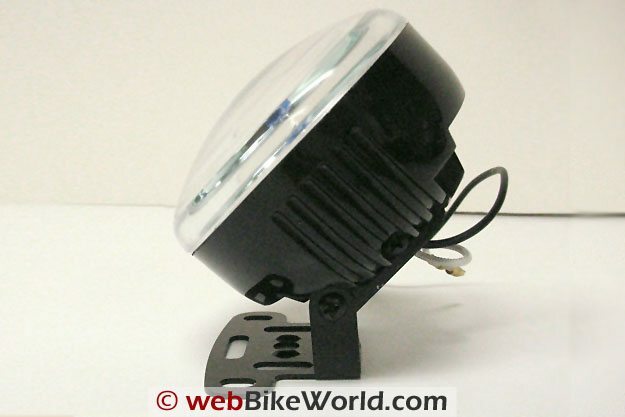 There isn’t much information about these types of lights available other than the occasional user comment found in motorcycle forum groups or contained within a manufacturer’s promotional literature. So I wanted to provide an actual photograph showing the light patterns produced by these lights and a hands-on analysis of their construction and features. I felt that this would provide someone considering buying one of these kits with a better idea about how the lights actually performed. Optronics is based in Muskogee, Oklahoma, U.S.A. and is a “manufacturer and supplier of recreational, industrial, and vehicular lighting products and accessories”. Optronics Platinum Burner QH-75IT Driving Light – Kit Contents. The housing on these lights appears to be made of stamped steel painted gloss black. The mounting bracket is a U-shaped design with several oblong cutouts on the base of the bracket to allow a wide range of screw placement possibilities. Protruding from the rear of each unit is one black and one white wire, each with a bullet connector attached. The lens on the unit is clear, but appears to have a slight bluish cast which comes from the blue tint of the 55-watt H3 bulb inside the unit. The outer surface of the lens is smooth with no indentations or texture. The reflector inside the light housing is a smooth reflector, not a faceted reflector like those used in some other lights. The units appear to be attractive, very durable, and well-made. The mounting bracket is designed in such a way as to provide the user with a wide variety of options in terms of where and how to orient the units, depending upon the position of the bracket and the holes used to mount them. The unit can be mounted in either an upright or inverted configuration. The illuminated rocker switch provided with the kit is probably better suited for use in an automotive or ATV application rather than a motorcycle installation. Neighbor’s House during the day and at night when illuminated by the driving lights. Optronics Platinum Burner QH-75IT Driving Light Close-up. The most interesting thing about this particular lighting unit, as is the case with all of the units tested, was the light pattern it generated. The light pattern was what I would describe as a round cone-shape consisting of a concentrated bright spot in the center with a less intense secondary light pattern surrounding it, somewhat like a halo. The pattern was not particularly wide or high, but rather concentrated. At a distance of 67 feet from the wall upon which it was displayed, the overall pattern illuminated an area about 10-12 feet across horizontally. The pattern consisted of the main concentrated beam being about 6 feet wide and 3 to 4 feet high, and the secondary surrounding light pattern extending to a height of about 8 to 10 feet. Please refer to the pictures provided for a detailed look at the light pattern. Notice the light that is illuminating the grass in front of the wall where the light pattern is most prominent. Remember that in a motorcycle application, this light would be benefiting the cyclist by illuminating the roadway in front of the motorcycle. Optronics Platinum Burner QH-75IT Driving Light – Side View. The Platinum Burner QH-75IT driving light kit is attractive, well-made, and is guaranteed by the manufacturer for three (3) years. That is a testament to how much they believe in their product. The kit contained everything needed to install the lights in most applications. The lights are readily available at your neighborhood Walmart and the cost for a set is less than the cost of an oil change and filter for most bikes. The light pattern is strong, concentrated, and provides a good deal of additional light at a very reasonable price. ADDENDUM: Although the lights are listed with the QH-75IT part number on the Optronics website, this box purchased at Walmart uses a QH-85CD part number. The QH-85CD set is not shown anywhere on the Optronics web site. Why? I have no idea. What is the difference between the two (if any)? I have no idea. I think that the manufacturer might use a different model number for a standard product line item when they sell that item through a large account, like Walmart. The model number in the upper right hand corner of my box is QH-85CD. The Installation Instruction sheet inside the box also lists them as the QH-85CD. Perhaps it’s a way of tracking sales through Walmart or perhaps it has to do with warranty issues (or perhaps they changed the part number recently). Manufacturer: Optronics List Price (2009): $19.94 per kit. Review Date: February 2009 Note: Listed as the QH-75IT model in the Pro Burner Series on the manufacturer’s website. Editor’s Reply: And remember that state laws can change without much warning, so what’s legal today may not be tomorrow! From “W.E.” (2/09): “Good review – thanks! 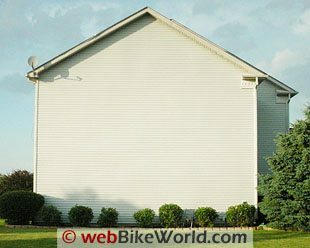 I’d like to see some on-road information – how mounted on the bike, how well it helps augment the beam pattern , etc. 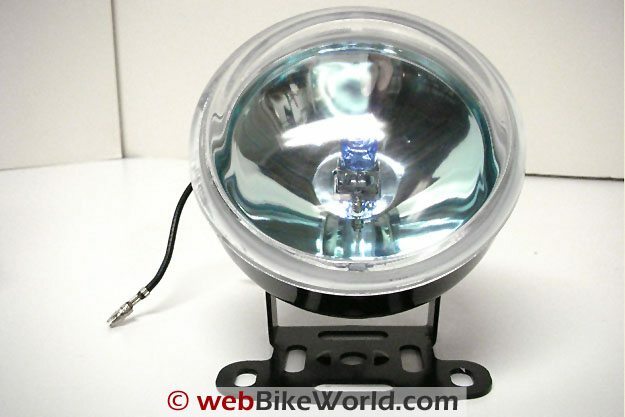 One point of note – I had a similar set of $20 lamps from Wal-Mart mounted low on my ST1100; they worked well but needed to be mounted far forward so the light coming from the clear ring around the edge did not glare in your eyes. Under the nose cone worked for me. Darryl’s Reply: Those are both excellent points. None of the inexpensive driving light kits evaluated for this series of articles incorporated any type of shade or hood to block light or glare projecting upward when the light was lit. This “unwanted and annoying” characteristic is really hard to determine beforehand and is usually not apparent until you have the lights positioned on your bike and energized prior to final mounting. 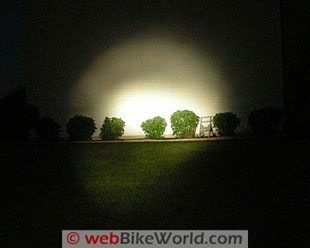 The “glare” issue is especially prominent in lights mounted high-up on the front of the bike where they fall within the peripheral viewing area of the biker. As to the durability issue, although one would hope that the company manufacturing a particular light set would have incorporated some type of vibration control/damping design features into the unit prior to manufacture, the low cost of the units probably limits the engineering of such features to some extent; after all, these light are supposedly designed to be attached to automobiles and trucks that are going to be subjected to the bumps/ruts/potholes encountered in everyday driving. A location offering easy access and removal of the light is another thing to consider when choosing a final mounting location on the bike.